We’re excited to be returning to the Schuylkill Banks for our 5th year of donation-based outdoor classes. We will continue the schedule we’ve had in past years, and we are adding a Thursday evening class.Yoga on the Banks meets on the grassy area at 25th and Locust, near the Schuylkill River Banks boardwalk in Philadelphia. In order to meet our mission of making yoga accessible to everyone, Yoga on the Banks is donation-based, and has no set fee. This program is entirely supported by you – our students – and your donation is gratefully accepted to support our teachers and assistants, insurance costs, and the administration of this program. 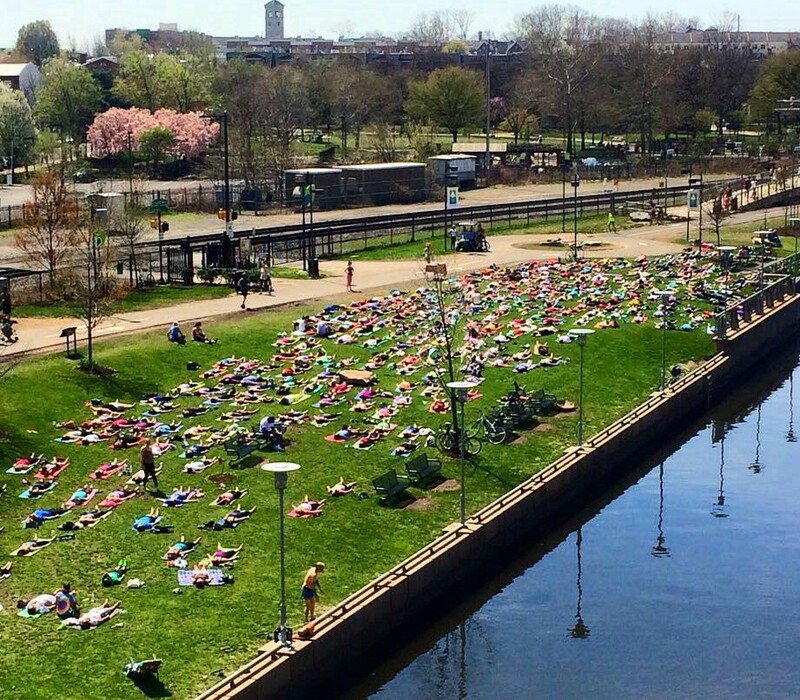 Philadelphia Yoga on the Banks classes are accessible to all levels of students – even if this is your very first yoga class! Bring a friend, bring your child, even bring your well-behaved dog. Because we practice outside in the warmer months, we suggest you bring your own mat or towel to practice on, sunglasses and sunscreen, and water bottle. There is a free public water fountain on site, and a public restroom. For up-date-weather and other announcements, please follow our Facebook page. Hi! Do you know who is teaching these classes yet? Weekend classes will be led by Erin Gautsche (Sat) and Kathryn Blessington (Sun), with occasional alternates. Tuesday mornings will be led by Kelly Love and Tuesday evenings, Kaleema Poles. We have a great group of enthusiastic teachers this year, looking forward to serving our students! Yes! We will start April 18. See you there! Hi! I had read in another article that the Tuesday outdoor classes were starting on April 26. Is that correct, or does that not begin until May? Thanks!! Tuesday outdoor classes will begin the first week in May! When do these classes end? We will hold classes until it gets too cold or raining – usually mid to late-October. Check Facebook for Up-To-Date Weather Info~! Saturday, May 5th we begin our 5th Outdoor Season!